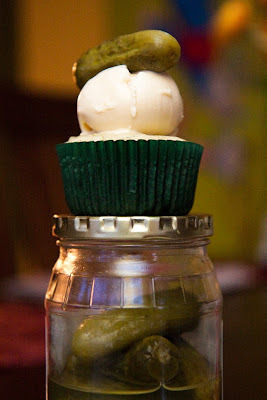 Pickle and ice cream cupcakes! Out of all the very weird cupcake concoctions we've blogged about over the years, I think this one from Cupcake Project (via Unique Daily) truly takes the cake! Shockingly, I really liked the pickle and ice cream cupcakes. The cupcakes themselves tasted like a pickle in cake form. The prominent flavor was definitely dill and they were somewhat eggy like a dill quiche - not very sweet. If you like dill and you like pickles or you have a pregnant woman in your life who has a good sense of humor, you might consider making these cupcakes. But, my favorite part of eating these cupcakes was actually dipping the pickle in the ice cream and sucking it off. I couldn't believe that I liked that combination of flavors. Weird! Do pregnant women like pickles and ice cream because they are phallic? Do I realize that my grandma reads this? I enjoy pickles. I enjoy ice cream. Why not both? sounds....gross...but i guess you never know until you try~! hi, i know i'm a little slow and everything, but how do i get a good buttercream frosting I can put on my cupcake?